Professional Joomla Directory Site in Seconds! Giving you the flexibility to create any type of Directory: Business Directory, Product Catalog, Movie Database... and much more. See how these cool features can make your wishes come true! Ready to use advanced designs and layouts. Responsive and mobile design ensures scalability! With the responsive design capabilities of JomDirectory, your website design automatically adapts to different screen sizes and easily translates to a mobile platform from the desktop version. Wherever you want to create a Business Directory or Product Catalog, you can choose the respective layout. JomDirectory is very flexible, allowing you to create and customize your own layouts. Advanced search algorithms that give results in seconds. Let your users filter content super quick based on custom fields, categories and more Quick built-in input field for searching through long lists of categories or addresses in the filter window. With JomDirectory, the data structure changes to meet your needs, not the other way around. The flexibility of JomDirectory's script data structure is made possible by its support of custom fields. Through these custom fields, you are free to create any type of content. You have a variety of input options including inputs, dropdown boxes, text, checkbox, link, tabs, and much more! Easily separate custom fields on your condition such as optional fields or mandatory fields. Products showcase with prices and custom fields. Linked with listings. 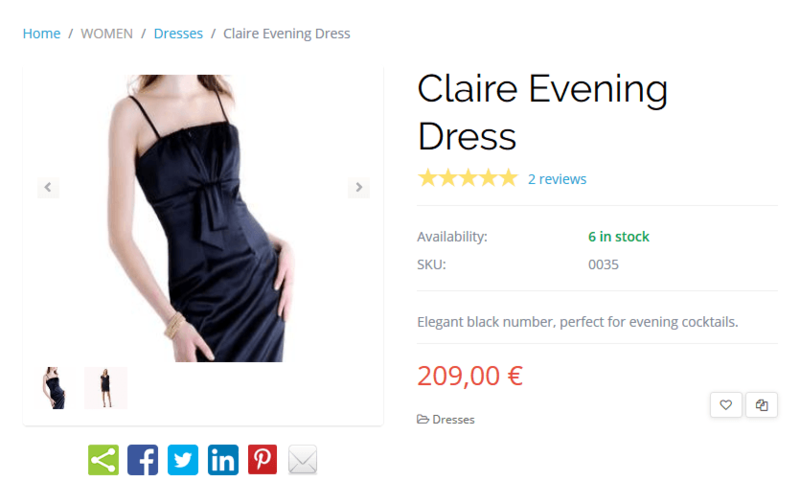 Quickly filter products based on theirs attributes and prices. Multiple search layouts available. Take your product catalog to the next level with JomDirectory's built in comparision tool. This tool makes in quick and easy to compare products side by side to ensure you make the best choice every time. Multiple booking slots with prices. Specify Service time slots with fixed time and prices that can be booked. Booking slots can be purchased with the shopping cart extension. Services can be categorized based on listing specification. 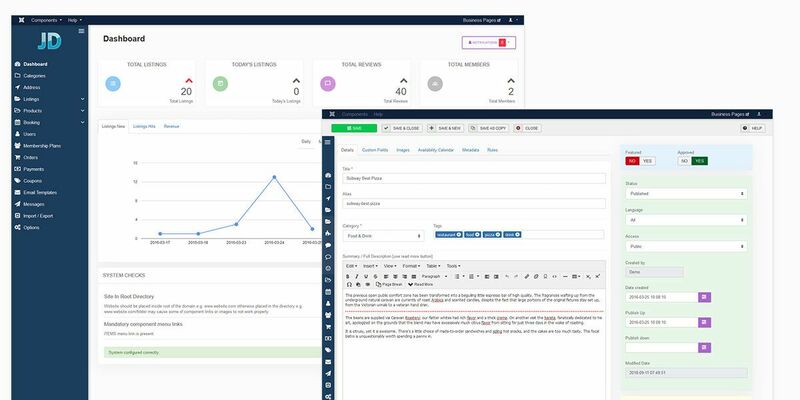 Full access back admin & front admin demo. 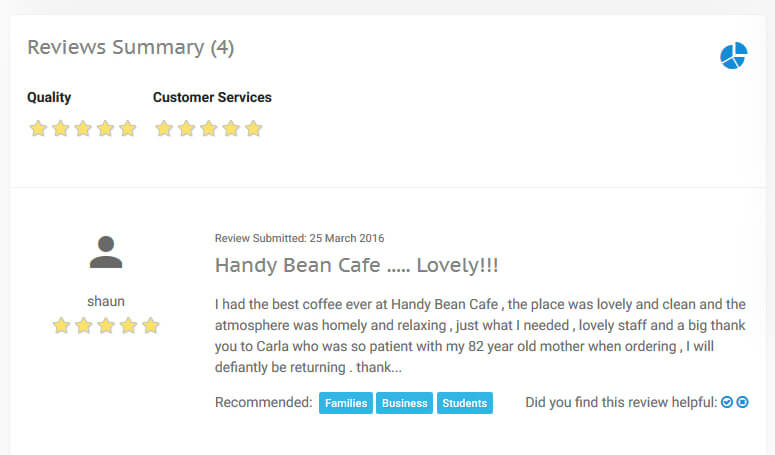 Understand how satisfied your customers are with your services with advanced features such as ratings, recommendations and likes! JomDirectory supports built in reviews to let your listings be rated by users. Built-in captcha helps prevent spam. 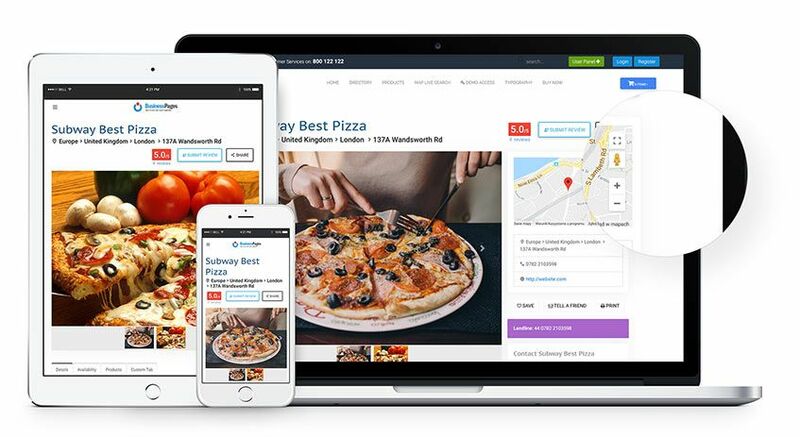 Notifies users that their reviews are approved via email. Both Knob style and Star style ratings supported. Advanced User Panel interface with professional dashboard, statistics and membership information. 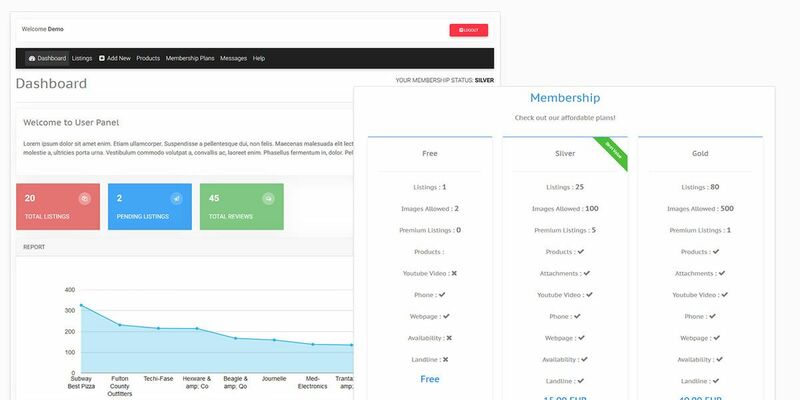 Create new listings within seconds, edit and publish reviews, add images, add additional information and much more Change your membership settings and view private messages sent by customers. View your listings and statistics for each listing separately. Approve comments right from the dashboard. JomDirectory understands the importance of being Search Engine Friendly and thus offers maximum resources to achieve that. With multiple SEO features such as optimized listing titles, correct indexing of all pages by search engines, individual SEO settings for each listing, and much more, you can never stay behind your competitors. 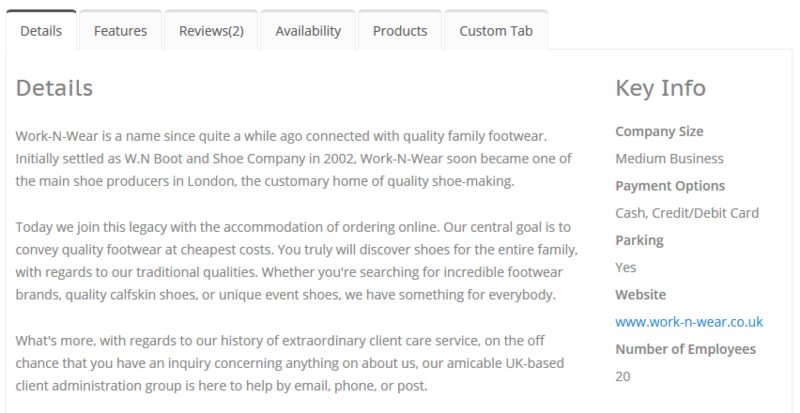 JomDirectory also supports Joomla Breadcrumbs and integrates Rich Snippets. Rich Snippets are very powerful in letting users know what your page talks about at not in first glance when they run their query on any search engine. Modules with multiple configuration and layout settings. 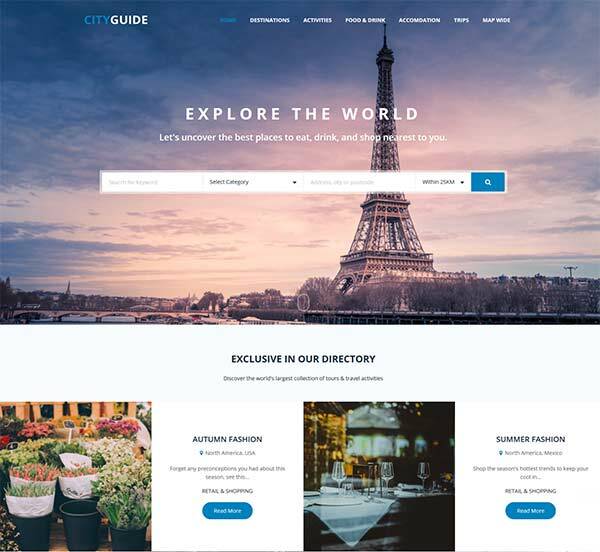 CityGuide niche of JSN Mini 2 - an impressive Joomla Template of our great partner JoomlaShine, works in harmony with JomDirectory to give you the best Tourism website ever. Special offer: Buy JomDirectory and get a 20% discount code for all of JoomlaShine templates and extensions. Check out other directory script features. JomDirectory script fully supports multilingual content. All elements such as Categories, Custom Fields or Addresses can be translated into any language, with complete ease! Joomla URL aliases provide support for all your non UTF-8 characters. 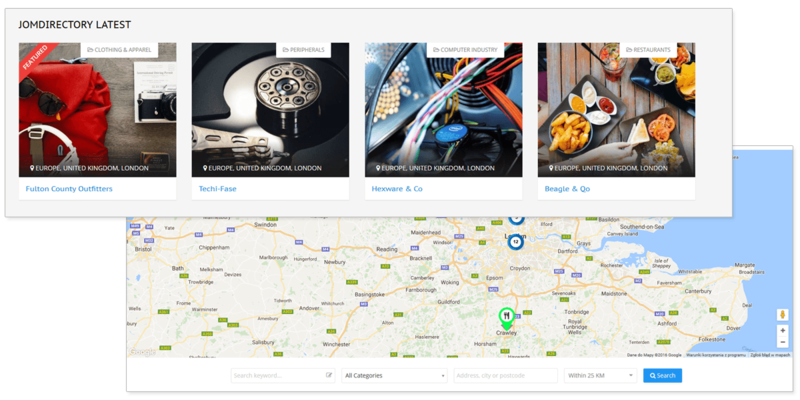 JomDirectory listings can be linked into JomOffers offers, making the advanced ratings and reviews, company biographical information, and much more available to be included in the offers. Keep you visitors up to date and ensure they never miss another important event. 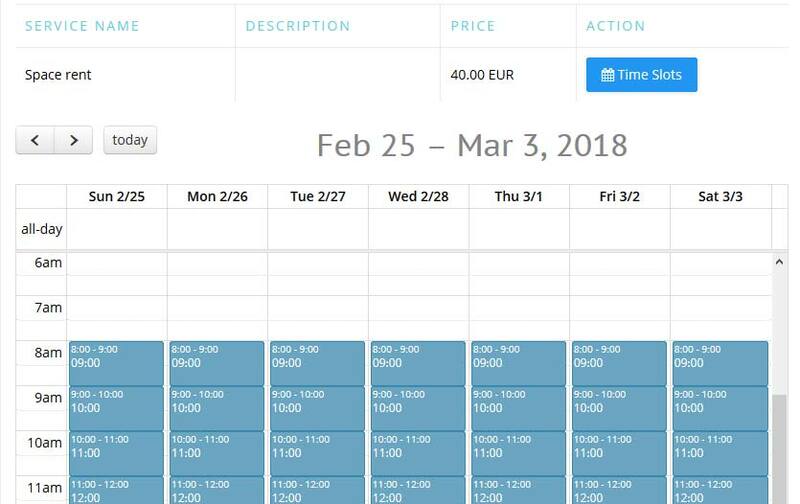 Share you appoinments and other events with the simple, yet powerful, built in Ajax calendar. Combine it with the Social Media integrations and share with your followers too. Get quick answers to your queries through JomDirectory support forums! Experience email and support ticket resolution at lightning speed. Are you ready to start your own Directory Project?